The pain associated with the electrified tape creates a mental barrier for the horse! must be kept "on" at all times ! A) The horse does not see the wire and runs right into it. 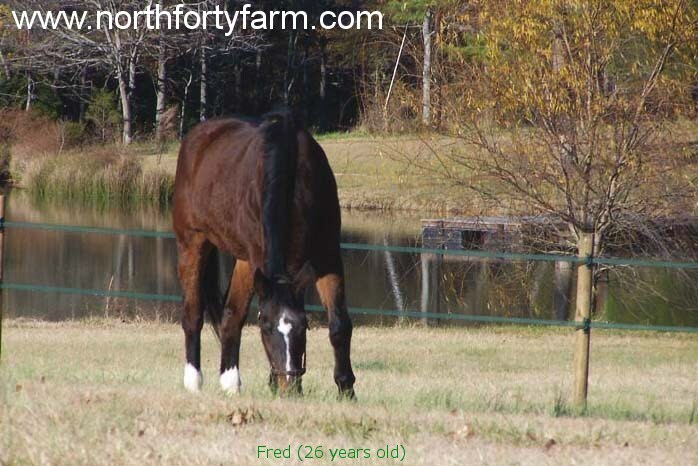 As we all know, horses are nearsighted and injuries due to wire fences provide vets a lot of business. B) The horse sees the wire or narrow tape, but is agitated enough (perhaps his barn buddy was leaving) that he tries to break through the tiny obstacle that he perceives to be only the size of a twig. Sometimes the horse will dance or even stand there trembling with indecision. Some horses will actually bump the fence to test it. When we can take action, we generally try to distract the horse to discourage him from going on. You can find a lot of lucky horse owners who have never had to cope with such critical situations as A & B, or deal with the resulting injuries, but there are so many other possible critical fence situations that could happen. It is best to be prepared and to use your knowledge to prevent whatever you can..